The above info came from Joe M, and was edited by yours truly (contact me). The image came from Amazon.com. 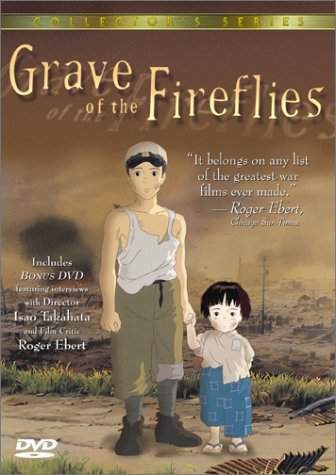 Grave of the Fireflies shows the Japanese perspective of World War II when the Americans fire bombed Japanese cities. It is the story of a young boy named Seita, and his little sister, Setsuko. It shows their experience as they try to survive on their own in the aftermath of the fire bombing in their city Kobe. in 1988, Studio Ghibli made two movies at the same time. Grave of the Fireflies was one of them, and My Neighbor Totoro was the other. My Neighbor Totoro is definitely the more upbeat of the two.